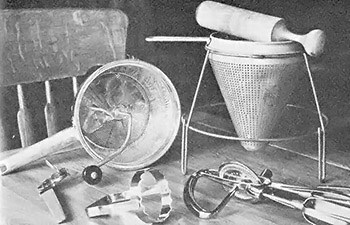 I ran across a post on one of the blogs I get digests for titled ‘35 Manual Kitchen Tools and Gifts for Peppers’. Now, being as I collect kitchen gadgets and other tools, of course, this caught my eye. 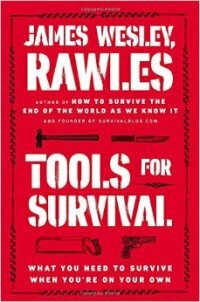 ’35 manual tools and gifts’ ought to have some good ideas, yes? Um….well….no, not really. I already have all of those items, or things that I can use in place of them that work just as well, and the list isn’t 35 unique and useful items but has several functional duplicates. A manual meat grinder and meat mixer top the list, and while these are useful, they are not as useful post emergency for the simple reason that they likely won’t get used. Simple fact is that the majority of the meat post emergency is either what you have on hand or what’s shipped in, not beef in your back yard, nicely butchered, hung, and ready to process. Next is a rotary egg beater. These are useless compared to a quality whisk – they take two hands to use – and an egg beater also has more moving parts to break. When you get a whisk or two, get the ones with nice fat handles. The skinny wire wrapped ones are harder to use and not made as well. Manual food processor: this, in my family, is what’s known as a knife. Butcher kit: again, not likely to be used, and you have to have the raw material (not likely) and b) the skill/knowledge (again, not likely). Vegetable peeler: you can always use one of these in the kitchen, but they are a very personal thing. I have several, and some work better than others. Not a great idea for a gift for someone else as everyone, I believe, has his or her own preference. Mandolin [sic] slicer: I believe it’s a mandoline, actually, and not a musical instrument converted to another use. Again, a knife will do the trick on this. French press: stainless steel version’s recommended; I have a glass press and a replacement carafe on hand, and while the glass is fragile, it’s borosilicate (think lab glassware) and actually tough regarding temperature changes. Not worried about it getting banged around much; my hand doesn’t shake that much in the morning. Manual coffee grinder: the old-fashioned crank kind with the little drawer in the bottom is suggested in this list. Check out the kinds backpackers carry instead. Wooden spoons: Um….why? And why not bamboo, which is naturally anti-bacterial? I use a bamboo spatula when I’m stir-frying, but I never use wooden spoons. Knives: definitely not a good choice for a gift. Knives are very personal tools, much like hammers, and your idea of great knife might be ‘How nice’ to the recipient. Manual knife sharpener: if you have knives, you already have one in your knife block or can use a stone from your shop tools. Stainless bowls: again, this is a matter of personal preference. The shape you use depends on what you typically cook, and not knowing that makes it hard to get what your recipient might like. Kitchen scissors: most people already have these in their collection. Tea kettle: you can use a stock pot in a pinch. The one linked to on Amazon.com is stainless, which is nice, but has a crappy uninsulated handle, only heats one quart, and no whistle. Grater: does anybody really need another one? Kitchen scale: analog kitchen scales are nice for weighing shortening and lard and brown sugar. Other than that, not much use AFAIK. Oven mitts: or potholders. Most kitchens are well-stocked with these already. Heavy duty tongs: with silicone ends. Um…yeah, reaching over the fire with something meltable: I don’t think so. Get all metal, stainless. Think BBQ tools. Hand grain mill: if you’re buying for a prepper, wouldn’t they already have one? Strainer bags: if your recipient has ever made jelly or jam, they likely have one already. They are reusable, and a clean flour sack-like towel or some muslin can be used in a pinch. If your recipient has never made jam or jelly, PSHTF isn’t a good time to start in on that. Mason jars: interesting. Good for storage, but the next item in the list is reusable lids, which the post author says have a fairly high failure rate. Conventional lids are great for a second use for dry goods canning. A vacuum packer might be a good alternative for a lot of things. Pressure canner: another item the recipient probably already has. Never mind. Meat cuber/tenderizer: gonna quote this one: “If you rely on venison and game that isn’t well marbled (because they haven’t been fattened on corn), a manual cuber/tenderizer can make meals a whole lot more enjoyable.” Hardly any venison here; not much game other than the occasional squirrel. Hence, not much use for a tenderizer. Kitchen timer: Love the item linked to: almost the same number of 5 star reviews and 1 star reviews. Average reviews: 3 stars. Get a good one instead. Cast iron cookware: most cooks who prep have this already. Ask before you duplicate, as it’s hard to regift. Camp stove: I’m ambivalent on this. I have one, somewhere, and also a one-burner butane stove. Scored 20 cans of butane to fuel it with at the local restaurant supply store for about $20 total, so am prepared either way, but fuel will be a problem if you don’t consider the recipient’s resource base (like, do they have a source for the fuel for that particular stove PSHTF?). The recommended camp oven might be handy, but I wager that baking’s been thought of by the thoughtful prepper. Measuring cups and spoons: the best set in my opinion is not yet another cup, half cup, etc., but one that includes ¾ cup, 2/3 cup, etc., those funky measurements you often find in recipes. Also, the pinch/smidgen measuring spoons. Most folks don’t have those, I wager, unless they go in for gadgets. Funnels: the best one I’ve got is a stainless canning funnel because I use it to fill my traveling coffee cup in addition to canning jars. For filing some spice jars I have, I found that the funnel you can get to refill water bottles works perfectly. Meat thermometer: nice, but…most people already have one. How about an MSR Alpine Dish Brush/Scraper? It’s small, but great for scraping dishes and the bristles are stiff; I use this daily for prepping dishes for washing. Check out how backpackers wash dishes with little or no water for ideas. Bamboo cutting mat – they’re naturally antibacterial and easier on a knife edge than glass or (surprisingly) a plastic mat, although a set of color coded plastic mats (some for veggies and some for meat) and a bamboo mat would be cool. Bamboo cooking utensils – again, antibacterial, and great for cooking in just about any sort of pan. Stainless coated aluminum or copper pans – I have three different pans, one for frying, one for soup, and one for stir-frying, and they are three different brands. I find that they are easy to clean, and I wager that folks with Revere Ware and the like (which I also have a lot of) would find their heating properties and ease of cleaning nice to have PSHTF, but might not have wanted to put the money out for. Pot strainer: not the moon-shaped one with a handle; for large pots of this or that you probably need both hands for pouring or draining, so it should be something you can clip on. Another tea ball for herbs and spices for soup so your recipient’s tea doesn’t taste like Red Rose Beef. Or if they don’t do tea, they’ll have one when they didn’t think they needed one before. Cold thermometer to see if the emergency ‘fridge’ is keeping food cold enough; oven thermometer for the alternate oven used for baking. Supplies for whatever cooking methodology your recipient already uses, like a new sourdough starter, or a baking stone. Whatever you do, do not assume that the recipient (if a prepper) won’t already have or thought of what you want to give them. Ask first! A gift certificate to enable them to buy something that they wouldn’t be able to justify otherwise, or maybe for that class on making jam and jelly is good, too. I like your list and started my own manual kitchen collection a decade ago. I can’t find a rugged mechanical egg beater, most are made of cheap stamped metal. Perhaps someone can make a suggestion. I would be grateful. One of the nice things I acquired was a top end mandoline complete with all sorts of slicers and graters nicely contained in a plastic case reminiscent of a Craftsman socket and ratchet set. My coffee grinder was acquired in the old DDR and is an industrial stainless steel model probably created for an officer’s mess. Cabalas sells stainless steel coffee pots in many capacities. These pots are intended for use over a fire and do not need filters. Of course they have multiple uses. Cabelas sells a stainless steel butcher’s saw and really neat, stainless steel blades for the SawsAll. These things make quick work of butchering. Heavy as all get out but rugged enough to withstand most camp fire use are the fine line cast iron pots and skillets made by Lodge. Everyone should have an assortment of Lodge. Regarding the reusable canning jar lids by Tatler, I have a stock of thousands and extra rubber rings. Most people find scrupulously following the instructions works well, especially in tightening the rings. After the jar cools, you can remove the ring and try to pull up the lid. If it is held down by vacuum, the seal is intact; if not, you can eat the contents and reflect on what might have went wrong. Every kitchen should have a non-electric pressure cooker by All American (no seals). I even bought an All American non-electric autoclave for my physician daughter and we stockpiled all sorts of medical instruments focusing on GSW and mechanical trauma such as amputation and crushing wounds, these likely post grid. I really enjoyed your post K.I. and look forward to reading more from you. I agree with Rourke on the Egg Beater. Get a whisk and you will end up with lighter fluffier eggs to boot. I use a whisk too, however you can check antique stores, there you will find old school beaters. I have one of the little plastic microwave scrambled egg containers that will hold the contents of one egg or two. Mixed with a little whole milk, it produces wonderful eggs about the size of an English muffin. Light, fluffy, and well cooked in just one minute. Never had a better scrambled egg. Egg beaters have many many uses other than scrambling eggs hence my desire for a robust mechanical beater. Who knows, perhaps I’ll have someone manufacture a line of cooking products that can be used with my battery powered Dewalt tools, something every man can appreciate. PR – I just bought a set of those plastic containers and they do work great. I am going to break with you on this one for I see things differently. Everyday cooking tools and SHTF cooking tools can be one in the same. If they are not, you may wish to expand your everyday cooking! I grew up where we had to cook on a wood stove living in Alaska. I also developed my cooking skills over the years for kitchen, BBQ, and out door cooking. My daughter and I do cooking events every year and have built up a interesting collection of cookware. We tend to specialize in lower cost foods like breads, tortilla, etc. What I have found is that tools of the trade also work in a SHTF. For example, we tend to divide up cooking into Low and Slow versus Hot and fast. BBQ is low and slow, Flank steak is hot and fast. Beans are low and slow, tortillas are hot and fast. So our cooking equipment tends to break down along these lines. We keep some equipment that has multiple uses. I can make a batch of biscuits in a dutch oven in a few minutes or slow cook beans in it for hours. We use a 20 inch diameter carbon steel plate that is half inch thick and heavy as hell for baking bread and also as a griddle since it does not drop temperature much when food is added. Korean hot pot is another example of a great everyday or SHTF device. You can get electric, gas, or charcoal hot pots. I remember my friends coming over for the first time. Their comment were almost always something like, you invited us over to make soup? Which is much of what a hot pot is since you are boiling food to eat. Oil fondue is another great thing to sit around a table, talk and slowly cook and eat. I have a number of really cool fondue pots with interesting alcohol burners. So in a nut shell what I guess I am trying to say is that every day equipment for SHTF can be equipment you can actually use every day! If you are not including SHTF cooking tools and methods like a hot pot or a dutch oven in your every day cooking you are cheating yourself out of some great food.